It has been a whirlwind year so far for the ZALORA team, and the upcoming months are about to get busier! In case you haven’t already heard, following the arrival of the iconic British high street brand, River Island last year, 2014 welcomes more global brands to ZALORA this month. In this issue, we bring you MANGO, the Spanish born, internationally famous brand that is leading the way in high-street fashion for the young urban women of today. We are super excited for MANGO to be joining our catalogue of 500+ fantastic brands on ZALORA. Synonymous with the sultry, polished elegance of Spanish style, MANGO launches its Spring Summer ‘14 covetable collection on ZALORA, that fuses easy-to-wear appeal with flawless European sophistication. Join MANGO fans - Daria Werbowy, Miranda Kerr, Kate Moss, Penelope Cruz – to name just a few, and get your MANGO Spring must-have looks today on ZALORA. Don’t miss our exclusive editorial featuring Daria Werbowy herself, in Mango Madness, plus our special MANGO on ZALORA feature. Before you go mad for our MANGO collection, stop in your tracks, as we have more high street heroes to introduce! The Brit cool brand NEW LOOK, from the UK, is now available on ZALORA for all the hot, young and cool fashionistas – along with famed American basics brand, AMERICAN APPAREL for the cool, urban hipsters out there. Check out our top picks from both of these highly coveted brands in our It’s time for a NEW LOOK, and AMERICAN APPAREL features in this issue. We did say we had been busy, didn’t we? The good news is we have many more amazing international and local brands coming over the next few months, so keep your eyes and ears peeled ladies and gentlemen… It will be worth your while, we can promise you that! 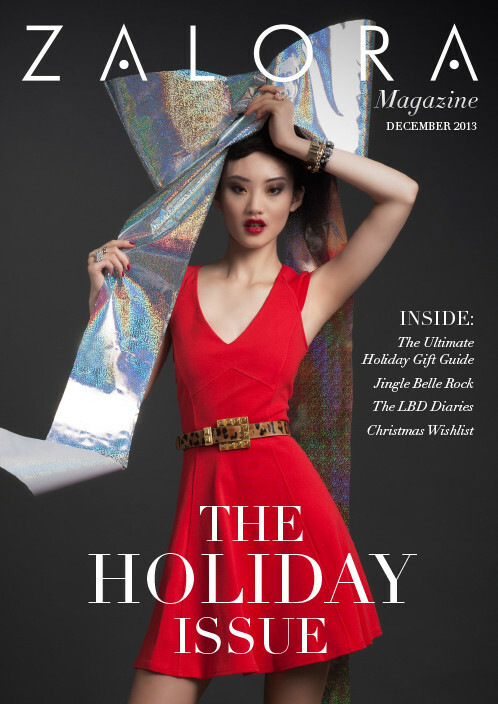 Enjoy the issue and happy shopping! STEP INTO THE SEASON WITH SPRING'S POP COLOUR LIP TREND. FIND THE PERFECT SHADE FOR YOUR SKIN-TONE IN OUR LIP COLOUR GUIDE TODAY! Medium tone or light shades of lipsticks are great options for porcelain skin tones. Peach, mauves or shades of pink are recommended to create a fresh, natural and healthy look. Avoid using a dark shade as it could create a harsh contrast. Show off your yellow or golden skin tone by opting for a sun kissed look. Choose warm shades such as coral and orange. Add gold eye shadow for the ultimate sun goddess glow! Olive skintones can sometimes look dull and tired, so lift your look by adding flushes of colour such as plum, raspberry or hot pink to revitalize your look. Enhance evenly toned, tanned skin tones with deep shades of red, berry, coral browns and brown-based mauves. Darker skin tones suit most shades of lip colour. Brighten the complexion with pastels, orange, plum, red and deep red hues. Embrace your passion for chic lingerie with the launch of TRIUMPH, one of the world’s largest underwear brands on ZALORA. With a passion for perfection in design and quality that is synonymous with true German heritage, TRIUMPH's continuous dedication to creating women’s lingerie has won the hearts of many customers. Moreover, TRIUMPH is the only European brand that produces intimate apparel specifically designed and tailored to suit Asian women. This month, our favourite fashion brand, EZRA, launches its new basics collection exclusively on ZALORA. The easy-to-wear wardrobe staples will be available in multiple colour-ways and at fantastic prices, starting from just PHP 9.90 for tops and PHP 24.90 for a unique range of dresses. Quality and attention to detail are key with garments featuring sheer and lace panelling, cut-outs, floral prints and PU leather details. The collection includes dresses, skirts, tops, tees, shirts, shorts and matching separates. The inaugural Singapore International Jazz Festival 'Sing Jazz' 2014, will be held from 27th February to 2nd March 2014 at Marina Bay Sands. Sing Jazz 2014 will feature four days of memorable performances by an impressive array of multi-award winning international jazz artists alongside local and regional talents. The festival will showcase the creative essence of jazz at its most enduring -- live and spontaneous -- while at the same time acknowledging and embracing influences across other genres of music. Every 14th day of the lunar month, Hoi An’s old town bans all motorized traffic and transforms itself into a massive performance venue for Vietnamese contemporary arts to the old trading town’s heyday in the 18th to 19th century – Chinese opera, Chinese chess, and of course, the region’s famous food. Shops put up brightly-colored lanterns, turning the narrow old streets into a radiant, festively-illuminated light spectacle. Entrance into the festival is free. Our date night with Hong Kong is on this month, with the return of Hong Kong Restaurant Week. With over 80 restaurants signed up for the first edition which will be held between 21st February 2014 and 2nd March 2014, this year’s Hong Kong Restaurant Week promises to be bigger than ever. During Hong Kong Restaurant Week, diners are presented with fixed-priced, multi-course menus for both lunch and dinner at new and popular restaurants in Hong Kong. The big names include Above & Beyond, Blue Butcher, Carnevino, Fish & Meat, Kazuo Okada, Lupa, Messina, and Yu Lei, to name but a few. Public reservations will begin at 4pm on 17th February 2014. THE SASSY AUSTRALIAN SUPERMODEL, VICTORIA SECRET ANGEL, BEAUTY ENTREPRENEUR, AND GLOBAL FASHION ICON MIRANDA KERR IS FRONTING OUR CELEBRITY STREET STYLE FEATURE THIS MONTH. FROM SYDNEY TO NEW YORK, NO-ONE ROCKS MODEL OFF-DUTY CHIC QUITE LIKE MIRANDA. SHOP MIRANDA'S EFFORTLESS CHIC, BOHEMIAN, SOPHISTICATED AND FEMININE ENSEMBLES TODAY.